This is a book about what happened to a handful of adoptees, relinquished for adoption as babies, during a time when society dealt with “unwed mothers” harshly. Because of the religious mores of the day, it was unheard of for a child, born outside of marriage, to remain within their family. The days of “shotgun weddings” had passed and a new experiment was in the wind. Young pregnant mothers were sent out of town, away from their entire families and friends. The shame they bore was unbearable, and giving birth completely alone was cruel and unusual punishment – normally one of the most important events in any young woman’s life. How were those babies who were “given up” for adoption ultimately affected by being permanently separated from their families of origin? Was it an easy adjustment for them? Did they sense something wasn’t right? Did they wonder about the mother who had given birth to them? It has always been believed that a newborn baby could be raised in the home of strangers and not be affected by that experience. This book offers a starting place in pursuing some of these answers. 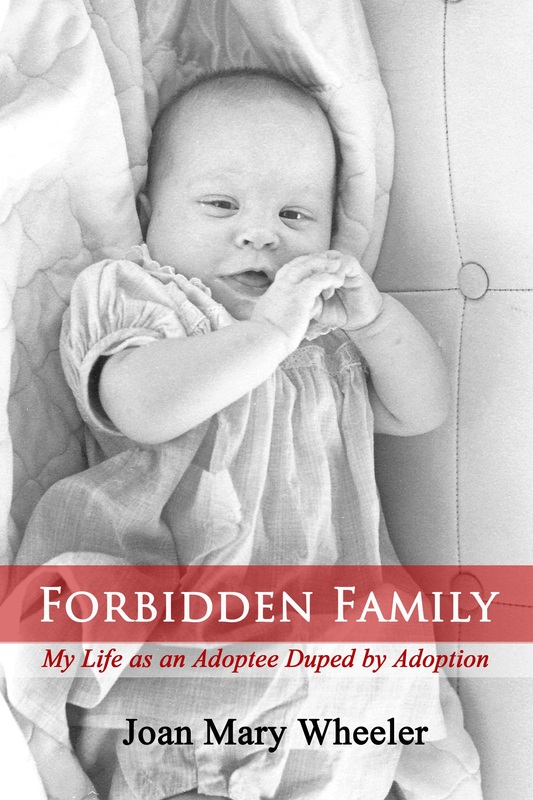 Sandy Musser, author of I Would Have Searched Forever (1979, 2013), What Kind of Love is This – A Story of Adoption Reconciliation (1982, 2013), To Prison with Love: The True Story of Sandy Musser’s Indecent Indictment & America’s Adoption Travesty (1995, 2013), and My Last “Love” Letter to President Obama: Exposing an American Institution (2016). The common narrative of adoption is that of the illegitimate baby born to a teen or young adult mother, but many adoptees were legitimately born to married parents. Some of us lost one or both parents to early death; we are full or half orphans. Some of us were removed from our married parents due to neglect or abuse, relocated to foster care, and then adopted. Some of us were children of divorce and remarriage who were then adopted by our step parents. Some of us were adopted by our grandparents or other family members. Some of us were re-homed and adopted more than once. No matter the circumstances of birth and adoption, there are common threads that run through the lives of adoptees that are often ignored by society. Turn this book’s pages to read about the seeds of emotional and psychological stressors experienced by adoptees, including many types of rejection, physical and sexual abuse by natural parents, adoptive parents, extended family and others. Doris Michol Sippel, author of Forbidden Family: An Adopted Woman’s Struggle for Identity (3rd edition, 2016). Since 1975, she has written numerous articles on adoption and adoptees’ revoked, sealed, and replaced birth certificates published in social work journals and newspapers. This is her second book. NOTE: While some people may see this as controversial, the Editors of The Buffalo News approved of my article. That is why they published it. Here is the link to the original article posted on The Buffalo News website on Thursday November 15. The print version was published on Friday November 16, 2018. New York State stole my birth certificate, revoked it, sealed the facts of my birth on Jan. 7, 1956, and replaced reality with an amended birth certificate in the name of Joan Mary Wheeler, swapping out the names of my parents with the names of my adoptive parents. This new document states that I, as Joan, was born to two people who neither sired nor birthed me. These legally appointed guardians renamed me when my adoption became final on Jan. 14, 1957. I legally reclaimed my name of birth in 2016. My adopters remain my legal parents. Joan’s birth certificate remains my legal birth certificate. Doris’ accurate birth certificate remains revoked and sealed under the 1936 state law designed to conceal verifiable facts. I’ve owned my secret birth certificate since 1974. My adoptive mother gave my documents to me days after my natural family initiated a reunion. Knowing that I do not have the legal right to use it, I did so anyway to reclaim my name, to update my name and parents’ names with Social Security and to obtain a driver’s license and a passport. My legal birth certificate does not match my other identity documents. The final step for a legal name change is to send the court order of name change to Vital Statistics to update my name with the “parents of record.” If I do that, a new amended birth certificate will be issued stating that I, Doris Michol Sippel, was born to Doloris and Edward Wheeler. That amended birth certificate would be far worse than the one issued upon my adoption. At least in 1957 my adoptive identity was completely separate from my identity of birth. Complying with this last step would mean that both identities would be mixed together, and my parents’ names — Genevieve and Leonard Sippel — would not be on my birth certificate. Does your brain hurt? Mine does. I refuse to take this last step. I broke the law. I do not care. New York State is at fault for revoking my birth certificate, sealing it, and replacing it in 1957. I petition New York State Supreme Court to update my parents’ names on a new amended birth certificate to align all of my identity documents with one another. Obviously, creating yet another amended birth certificate is illogical. I petition the state to restore my revoked birth certificate. According to current law, this would undo my adoption and dissolve inheritance laws with my adoptive family. The third and most realistic resolution also violates current sealed records law: Restore Doris Michol Sippel’s certificate of medical live birth, annul Joan Mary Wheeler’s amended birth certificate, and issue an adoption certificate. By doing so, the state would validate the facts of my life while not vacating my adoption. Then my brain, and my heart, would not hurt.